Hi loves! How are you today? I worked in Utrecht today and normally that's an hour away. Unfortunately (also for the person who lost his or her life obviously) there was a huge accident this morning, causing the road home to be closed off all day and evening. So I had to take a different route, which caused me to have a 2 hour drive home.. In the end I shouldn't complain though, at least I made it home! Today I've got for you 3 shades from El Corazon (the bottle says Kaleidoscope but I think it is a subbrand within El Corazon?). These are all the same idea but different basecolors: a jelly base filled with different sized white glitter. I like the idea behind these though I wasn't as crazy about each shade. Also formula isn't really consistent. Every color is 3 coats, no basecoat, topped with 1 coat of Essence Better Than Gel Top Sealer. They all felt smooth to touch with topcoat, no glitter poking out. Appaerently these do have names, I just can't read them. I tried to translate them with Google Translate and some guessing. If there are any Russian Readers here, don't hestitate to correct me! First one is №01, called Модница б oфuce or Fashionista To The Office. 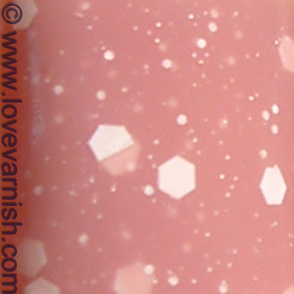 This is a soft pink sheer base. I think it is a bit too peachy and therefore can look a bit "dirty", it isn't a clean looking pink. 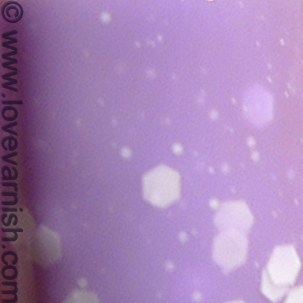 It builds up nicely in 3 coats, allowing the earlier put on glitter to show through the last layer. You can still slightly see my nail white. This is indeed an office appropriate glitter! Next up №07, called Модница к премьере or Fashionista To The Premiere. Most sheer out of the 3 I received, and a nice "in between" color. The rose color kinda reminds me of teacups somehow, don't ask me why. This was still quite sheer at 3 coats but putting on more wouldn't be something I'd normally do, so I won't for swatches either. It applied a bit harder as it was thinner, you have to be careful to not pool your cuticles. Last but not least, №05. This is called .... I have no idea! I can't seem to find the proper Russian letters, it doesn't make any sense in Google Translate.. I am clueless! Thank you Tanya Wish, apparently this is Fashionista On Shopping :-). It is a lovely shade of purple though, or should I say lavender? 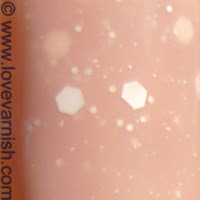 The white glitter really gives great contrast and this was the most opaque in 3 coats. It was a bit lumpy though. It shows a bit in my pictures how this wouldn't go on completely smooth. So tell me, which out of these 3 shades do you like best? I think the first one is my favorite, it is so soft and delicate! I like the lavender the best! I love these all so much!!!! Delicate jellies are so pretty. These are so pretty! The first one is my favorite! I like this collection: these 3 shades and all the rest :) The names are: 01 - Fashionista In The Office, 05 - Fashionista Goes Shopping (Fashionista On The Shopping), 07 - Fashionista At The Premiere. These are all so pretty, but the last one - purple - is to die for! They are delicate huh? Thanks for your comment :). Thanks Amanda, I guess I do too :). Thanks Alexis! I like them too :). Thanks for your comment! It seems the first one is very popular :). Yeah I don't like it at all hearing about such accidents, especially on roads I drive too :(. That's good to know babe :D! I'll stuff it in your package ;-). Thank you so much for helping me! Russian is such a difficult language, it doesn't make any sense to me. It is nice to see some readers that can help a girl out ;-). Thanks for your comment! I like that one too! So delicate! I love the lilac one!